Review by AllTheBestFights.com: 2016-03-05, Ruslan Chagaev vs Lucas Browne gets three stars thanks to a good second part of the fight. Ruslan Chagaev entered this fight with a professional boxing record of 34-2-1 (21 knockouts) and he is ranked as the No.19 heavyweight in the world. He suffered his last loss when he faced Alexander Povetkin in 2011 (=Povetkin vs Chagaev), since then he has won seven consecutive fights beating Francesco Pianeta in his last one (=Chagaev vs Pianeta). His opponent, the undefeated Lucas Browne, has a perfect record of 23-0-0 (20 KOs=87%) and he entered as the No.22 in the same weight class. He fought just once last year winning over Julius Long (=Browne vs Long). 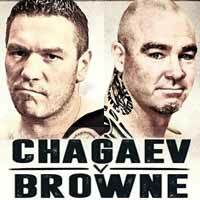 Chagaev vs Browne is valid for the WBA World heavyweight title. Watch the video and rate this fight!